Recap: Everything You Need to Know for Bal Érotique XII & CODES OF CONDUCT – MUST READ! 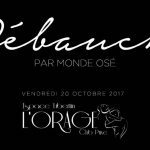 Bal Érotique XII | Discover the special CHARACTERS INSIDE MANOIR! Bal Érotique XII | Discover MANOIR, The Notorious ROOMS REVEALED!